Last week, the European Conference on Networks took place in Bologna Italy at the Palazzo della Cultura e dei Congressi. The Conference was having a strong focus on 5G (5th generation wireless systems) technologies and how 5G will affect the technological foundation and as well the social aspects. The impact of 5G to the society was often mention and discussed in the various panels and talks. The explanations, what impact 5G to social aspects and the society will have in the future, were all more a rational to constitute the rise of the amount of the bandwidth that 5G will bring. The almost incredible amount of bandwidth and the extreme low latency will offer a new spectrum of mobile applications – especially in the area of real-time applications. Mediation module: The data coming from the monitoring devices needs to be combined in a single user session and transformed in a common format. Charging module: The rating engine collects the usage records and applies the appropriate pricing strategy. Billing module: The basic billed amount in a billing cycle is generated by aggregating the charge records and readjusts it by applying discounts, penalties, taxation etc. User/Management interface: The service can be accessed by a web-based user-interface that allows configuration of every aspect of the RCB process. In the video below, a demo of the first Cyclops prototype is being shown. In the scenario, we take a look at the basic admin features: listing all the tenants and their respective users, checking the user status, calculating the accumulated cost per user, as well as starting a periodic counter for the specific user. The facility for defining the pricing function for a particular user, allows the admin to choose some of the available meters and apply standard arithmetics to get the desired formula. This is the first prototype for our RCB solution. In future, the platform would offer more advanced rating and charging models with the support for discounts, taxation, penalties etc, as well as support for other cloud platforms. Since we all know … Vader: Don’t lecture me, Obi-Wan! I see through the lies of the Jedi! I do not fear the Dark Side as you do! I have brought peace, freedom, justice, and security to the new Empire! In the our last article on OpenStack and OpenShift we showed how you could setup these two large systems quickly and fast but on your local system. Now what if you wanted to use OpenStack to provide OpenShift capabilities to a set of users? Well why not use the cloud?! So the idea in this post is to use OpenStack as a provider of a computation and storage (essentially a VM), quickly provision the VM and then through a quick set of commands have the VM ready to serve an OpenShift service. This is something that is done in the Mobile Cloud Networking project, where we use OpenShift as a means to provide a service orchestration capability for all types of services, including ones like EPC (evolved packet core) and IMS (IP Multimedia Subsystem). Next up we’ll look at modifying this setup so a number of VMs are used to provide parts of the overall OpenShift system. 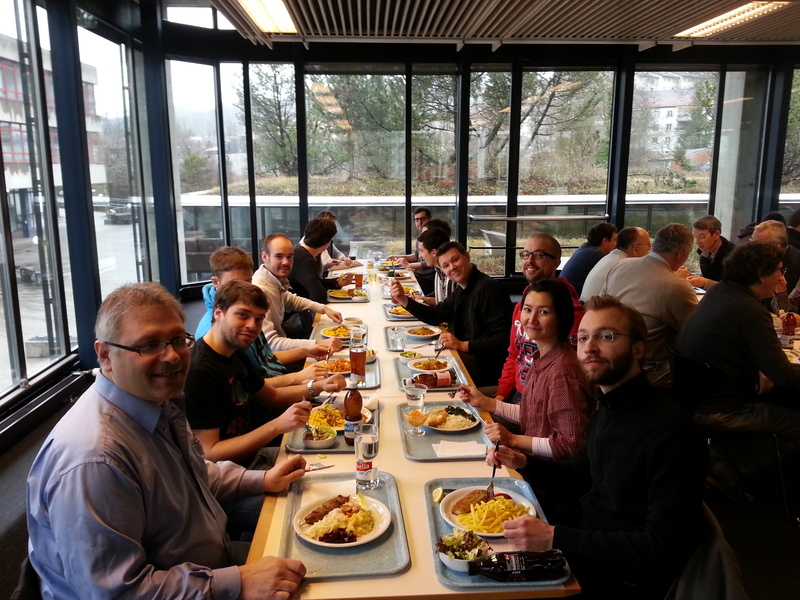 ICCLab attended the OpenCloudDay in Bern en masse. Being one of the most known (infamous?) cloud computing groups in Switzerland, we had to show our strength at one of Switzerland’s most prestigious cloud events! NOTE TO THE READER – 16 Jun 2014: after this post was published, some very insightful comments have been issued that made me consider the necessity of adding this note to warn the readers and remark what has been compared in this study. Ceph and Swift have been deployed and compared as object storage systems and not necessarily as ReSTful services (typically accessed over HTTP). Consequently, we have used librados to access Ceph and the ReST HTTP APIs to access Swift. This is a difference that marks a distinction between the two systems after they have been deployed on a private storage cluster. However, accessing the two systems with this two different interfaces entails a bigger overhead (thus less performance) for Swift than for Ceph. For this study, focused on small clusters, this is part of the differences between the two services under test. On production deployments however, it may make more sense to use the well established Swift HTTP APIs also for Ceph (available with the additional radosgw component) and the results here shown should not (read: must not) be applied for that case. Swift and Ceph are two popular cloud storage systems that provide object-based access to data (Ceph also supports file and block storage). The Swift project ships an open source codebase entirely written in Python and its development is currently led by SwiftStack. Feature-wise, Swift is an object storage service that supports ReSTful HTTP APIs, data replication across different logical zones, arbitrarily large objects, scaling-out without downtime, etc. Ceph is mostly written in C++, but it also includes some parts in Perl, C and Python. The company leading its development (InkTank) was acquired by RedHat in April 2014. Ceph presents a more rich set of features, most notably by supporting block- and file-storage besides object-storage. The supported file systems for object storage devices (OSDs) are xfs, btrfs and ext4, with xfs being recommended for production deployments. Data placement in Ceph is determined through the CRUSH algorithm, which computes storage locations for target data and enables clients to communicate directly with OSDs. Ceph allows for the fine tuning of many configuration parameters, including the definition of a CRUSH map (a logical description of the physical infrastructure of the data center), the specification of replication requirements on a per-pool level (pools are containers of objects), the definition of rulesets for data placement (e.g., to avoid placement of replicas within the same host), etc. 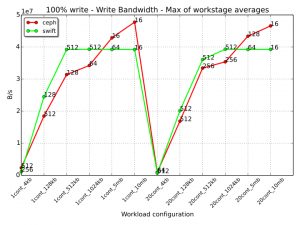 The objective of this experiment is to compare two different storage systems for the cloud (both Swift and Ceph can be used with OpenStack) with an object-based interface, with the intention of evaluating the performance of Ceph with respect to a system – Swift, that is considered to be very mature and counts already many production deployments. Important institutions or companies use Swift for their storage or as a basis on which their storage services are built (wikimedia, Disney, Spilgames, HP …). The storage cluster used for the comparison is a small one that could be seen in private deployments for limited storage needs or on experimental environments. This study aims at evaluating the differences that may arise when using the two services on such a scaled down cluster and which limiting factors should be taken into account when using distributed storage on small deployments. A storage cluster has been configured using three servers of the ICCLab data center and its networking infrastructure. All the nodes have the same hardware configuration and are connected over a dedicated storage VLAN through Gigabit Ethernet links (1000Base-T cabling). All the other devices in the cluster have produced similar results (all the hard drives are the same model). 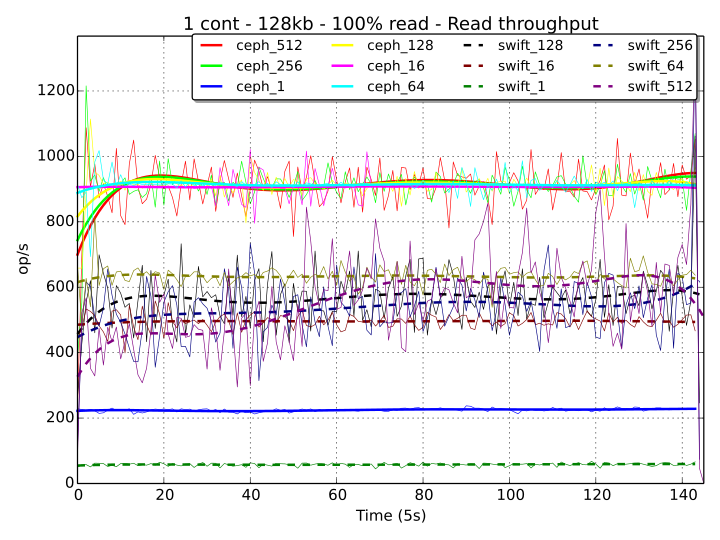 To avoid biases in the measurement of the performance of the two systems, Ceph was completely shutdown when Swift was running and vice-versa. For the production of meaningful statistics, equivalent configurations (where applicable) have been used for both Ceph and Swift. In both benchmarks, Node1 has been used as a “control” node (monitor node in Ceph and Proxy node in Swift) and it has not been used for data storage purposes. Node2 and Node3, each one containing 4 Hard Drives, have been used as the storage devices for objects and their replicas. For consistency of performance measurements, both systems have been configured with a replication level of 3 (three replicas for each object). No Metadata Server nodes (MDS) have been used as we have configured Ceph for object-storage only (MDS is required for the Ceph Filesystem). For each of the two storage nodes, two 1TB HDDs have been used as OSDs and a dedicated 1TB HDD has been used for journaling (the remaining HDD was reserved for the OS and software installation). All OSDs have been formatted with an xfs filesystem and gpt label. Each data pool was created with a replica size of 3 and min_size of 2 (each object is replicated three times, but I/O operations on a certain object are allowed after only two replicas are in place), using custom rulesets that allow the replication of objects within the same host (the default would be to replicate objects on separate hosts). In this case, the result of 133 has been approximated to get 128 PGs for this deployment. The Swift cluster has been configured with one proxy node and two storage nodes. To maintain consistency with the Ceph configuration, only two disks of each storage node have been used for data and formatted with an xfs filesystem. Similarly, to apply the same replication policy as in Ceph, each disk has been assigned to a different zone and the replicas parameter has been set to 3. All devices have the same weight and belong to the same region. Given the amount of available disks, and a roughly estimated number of 100 partitions per disk, the ring partition power has been set to 9, accounting for a total of 512 partitions. The auditor, replicator, reaper and updater settings have been left to their default values. 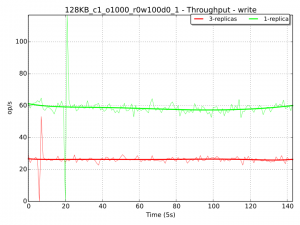 COSBench is a benchmarking tool for cloud object storage developed by Intel and released to the public on GitHub. Among the other supported object storage systems, COSBench supports both Swift and Ceph, the latter using librados for Java. COSBench allows the definition of workloads with a convenient XML syntax, it ships a web interface to submit new workloads and to monitor the process of ongoing ones and it automatically stores workloads statistics as CSV files. The COSBench version used to produce these results was 0.4.0.b2. One set of workloads has been defined and used for both Ceph and Swift. Some adaptations were required for the different authentication mechanisms and for letting COSBench use pre-provisioned pools (the equivalent of Swift containers) for Ceph. This change was necessary to avoid that COSBench created new pools which would have used undesired default settings (replication levels and crush rulesets not matching the needed ones and inadequate number of placement groups). For this benchmarks, 12 distinct workloads have been used. Each workload has been populated with 18 workstages (excluding the special stages to prepare and cleanup each workload). Each workload has been defined to use a definite number of containers (pools in Ceph) and objects size. For example, in workload 1, every workstage was running with 1 container and objects of 4 kB. Different workstages applied different distributions of read/write/delete operations and different number of workers for each read/write/delete phase. Each workstage had a rampup time of 2 minutes and a total running time of 10 minutes (for a total of 12 minutes per stage). The read/write/delete operations for each stage were uniformly distributed across the available containers for that workload and a fixed number of 1000 objects per container. The total number of executed workstages is given by all the possible combinations of the values of each column with all the others, resulting in 216 stages, for a total running time of 43.2 hours for each set of workloads for each storage system. In particular, the number of containers and the objects size were defined on a per-workload basis, while workstages within the same workload used different read/write/delete distributions and different number of parallel workers. Sizes are always expressed in bytes, even when a lowercase ‘b’ is used such as in ‘kb’ or ‘mb’ (kb = 1000 bytes, mb = 1000 * 1000 bytes). COSBench collects statistics about the system under test with a configurable period that for these benchmarks was set to the default value of 5 seconds. Statistics are then written to CSV files and also viewable on the web interface (for running workloads, statistics are also displayed at real-time). The metrics for which COSBench collects statistics are: Op-Count (number of operations), Byte-Count (number of bytes), Response-Time (average response time for each successful request), Processing-Time (average processing time for each successful request), Throughput (operations per seconds), Bandwidth (bytes per seconds), Success-Ratio (ratio of successful operations). Graphs have been generated from the CSV data output by COSBench using a dedicated tool that has been developed for this purpose: cosbench-plot. 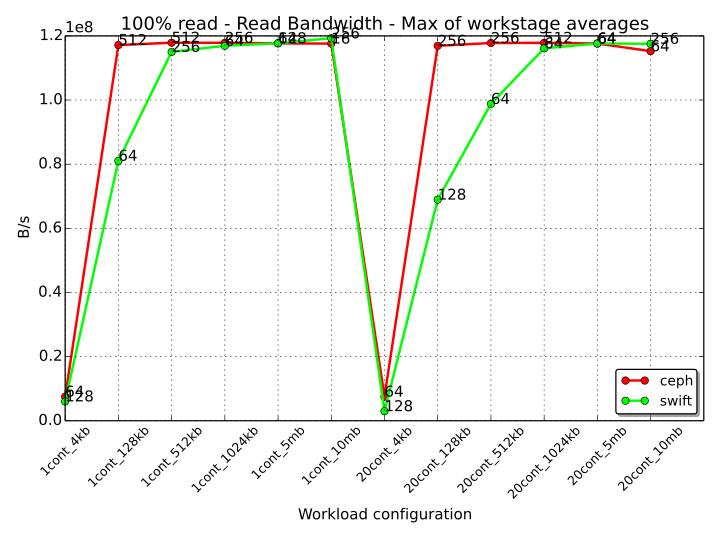 The following graph shows the read throughput for 100% read workstages for every workload for both Ceph and Swift. The values displayed in the chart are the maximums of the averages across the considered workstages for any particular workload. The text annotation next to each value denotes the workstage in which the average for that metric had the highest value. 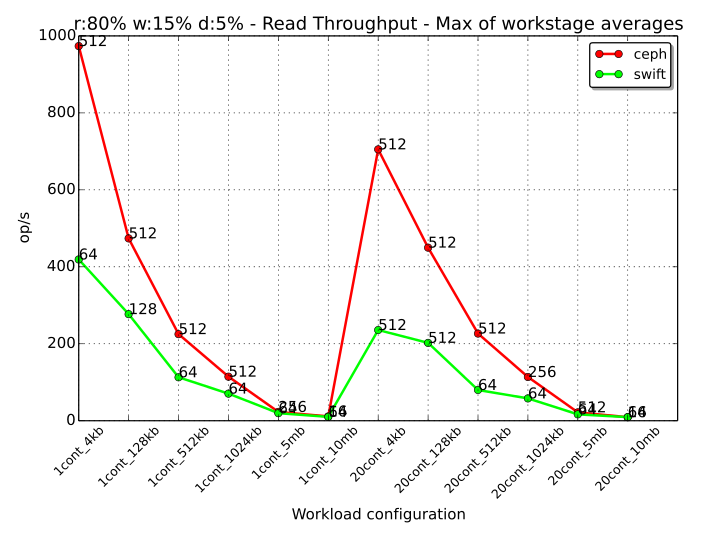 In this case, the annotation represents the number of threads for that workstage. 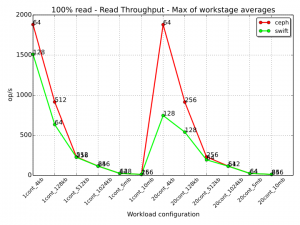 For example, we can observe that for the “1cont_128kb” workload (1 container, 128 kB objects), the Ceph workstage with 100% read operations that scored the highest average Throughput (across the workload), was the one with 512 threads. 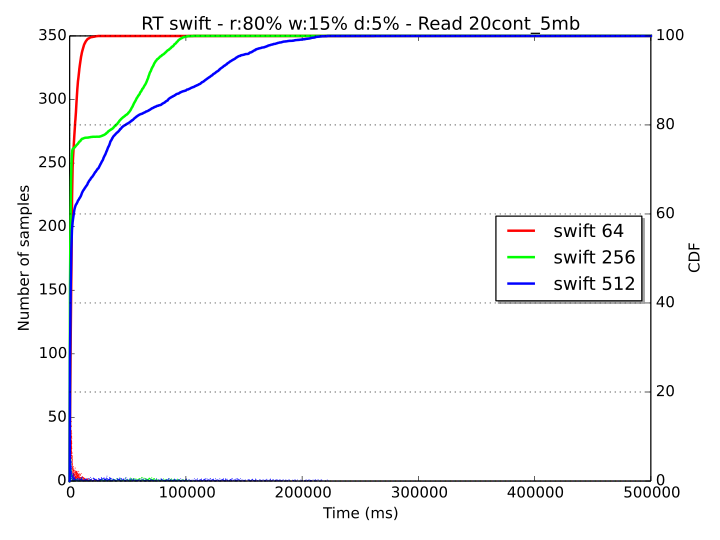 Swift achieved its best result in the same scenario with the workstage with 64 threads. 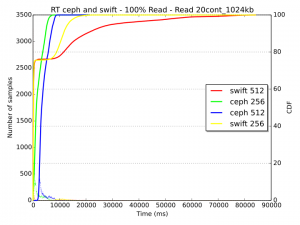 From this graph we can observe that Ceph manages a higher number of read operations than Swift when the object size is small, with an even more prominent difference when the available containers are 20 instead of 1 (20000 and 1000 totally available objects respectively). When the object size grows to 1024 kB and above, the amount of read operations that the two systems can perform is approximately the same, but each system reaches its highest performance with a different number of threads. The general trend that can be observed is that Ceph can reach a better performance with more parallel workers than Swift, denoting a better behavior to handle an increasing number of parallel requests. On Ceph, both workstages with 64 and 16 workers score well, while 512 workers obtain a slightly more degraded performance. This is due to the fact that threads are accessing (with a random uniform distribution) a single pool of 1000 objects of very small size, thus every read operation requires a very short processing time, compared to which, the overhead for the synchronization of the threads results to be not negligible. 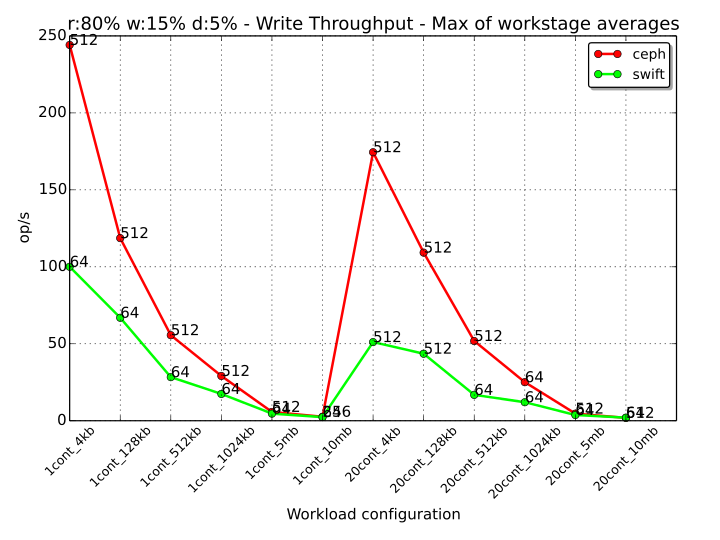 An interesting statistic comes from the workstage with a single worker, in which Ceph performs sensibly better than Swift. This is probably a consequence of the Ceph CRUSH algorithm for objects lookup with librados access being more efficient (in this case) than the HTTP-based access to the ring mappings in Swift. Again, this difference can be appreciated because the processing time for reading small 4 kB objects is very small, emphasizing the impact of the lookup operation on the overall performance. 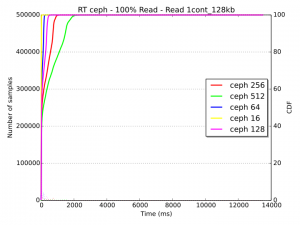 In case of slightly bigger objects (128 kB), we can observe that the throughput performance of Ceph is almost equivalent for any number of workers greater than 1, while Swift has a performance increase when going from 16 to 64 threads, but experiences a degradation when the number of threads is bigger than 128. The following response time diagrams provide a more clear picture of the saturation level of the system for the “1cont_128kb” workload. With Ceph (first diagram), only a small set of samples experiences a delay of about 2 seconds and almost all samples are below this threshold. 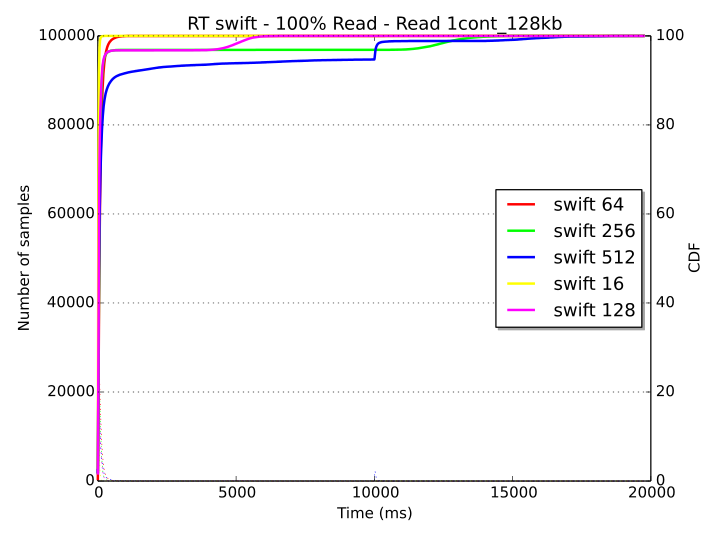 With Swift (second diagram), the response time is very low in all cases until about the 95th percentile. 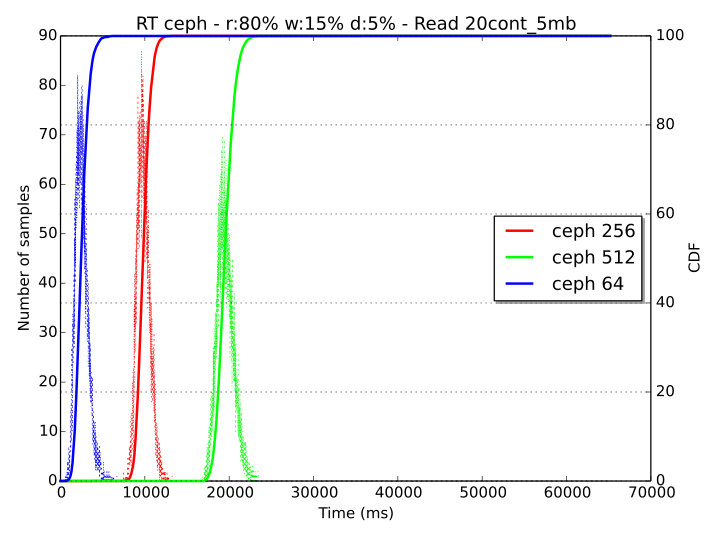 After this point of the Cumulative Distribution Function (CDF), some samples on the 128, 256 and 512 threads workstages experience long latency, with values that exceed 10 seconds. For what concerns these benchmarks, the bandwidth graph (below) shows that Ceph already reaches a plateau in the read bandwidth when the objects size is 128 kB for both 1 and 20 containers. Swift shows a similar behavior with 512 kB objects and 1024 kB objects for 1 and 20 containers respectively, with a more efficient behavior than Ceph when the size of the objects is 10 MB (Swift bandwidth is slightly higher in these cases). The upper bound for the bandwidth is 120 MB/s (1.2e08 B/s in the graph). This limit is below the reading bandwidth of a single disk in the system (ca. 140 MB/s), but matches the available network bandwidth of 1gb/s (125 MB/s), showing that the performance bottleneck in this small test cluster is the networking infrastructure. 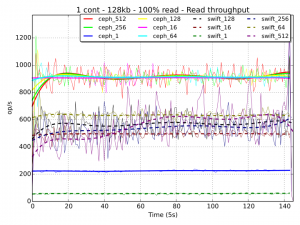 When considering how the two systems scale at the increase of concurrent requests, we observe that Ceph performance doesn’t degrade as significantly as in Swift with more parallel workers accessing the storage service. 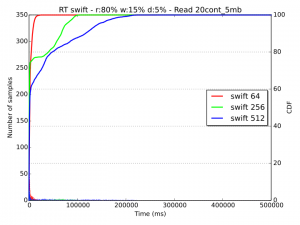 Swift obtains the best performance with 64 threads and its throughput decreases of ca. 20% when the threads are 512, denoting an already over-saturated system that cannot accommodate more requests. On the other hand, the performance for Ceph is equivalent regardless the number of threads and, even if the system is already saturated with 256 threads, when 512 workers become active, Ceph still manages to avoid starvation, as we can see in the response time diagram below. 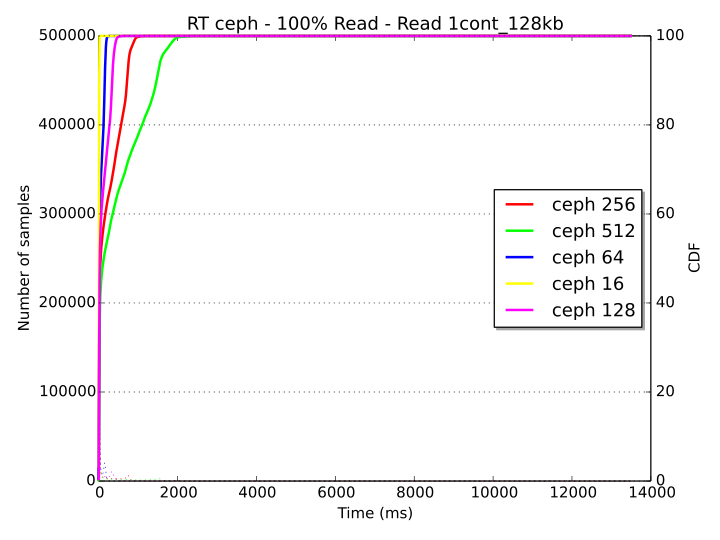 With 512 threads, Ceph has a delay of ca. 7-8 seconds at the 90th percentile, while the behavior of Swift seems more greedy, with less samples that experience a very small delay (ca. 75th percentile) and a significant portion of the remaining ones that can exceed a delay of 15 seconds (with 512 threads). 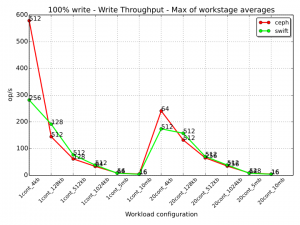 For each workload, the following diagram shows the 100% write workstage that scored the highest average throughput for each of the two storage systems (note that this diagram doesn’t take into account how Ceph and Swift manage the creation of object replicas and data consistency, a factor which will be considered later). Similarly to what we have seen for the 100% read workstages, Ceph performs better when the size of the objects is small (4 kB), with a sensible difference in the “1cont_4kb” workload where Ceph almost doubles the performance of Swift (with 512 and 256 threads respectively). Both for 1 and 20 containers, Swift has a better performance with objects size of 128 kB, 512 kB and 1024 kB with a decreasing gap that tends to zero when the size of the objects is of 5 MB and 10 MB (Ceph has a slightly better throughput for these last two cases). 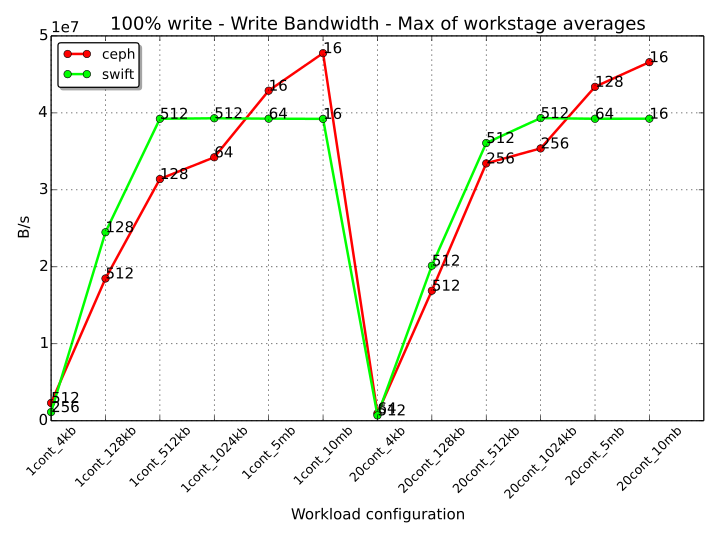 An interesting statistic for 100% write workstages is when Ceph and Swift are both accessed with a single thread as, in contrast with the read case, Swift performs better than Ceph. An example of this behavior can be observed in the graph below for one container and an object size of 128 kB. For a complete analysis of the write performance, it is also interesting to consider what is the impact of writing replicas of objects. With the configuration used for the data pools of this experiment, Ceph creates three replicas of each object (so each object is copied two times) and allows I/O operations after at least two replicas have been written. Ceph is a strongly consistent system, so it will also wait until the minimum number of replicas has been written to the disks before returning a success code to the client. In Ceph, writing the transactions log to the Journal also requires some extra overhead (unless copy-on-write is used, which is not the case for xfs filesystems). Swift uses a similar approach as it streams all the 3 copies of an object to the disks at the same time and returns success when at least two of them have been correctly written. 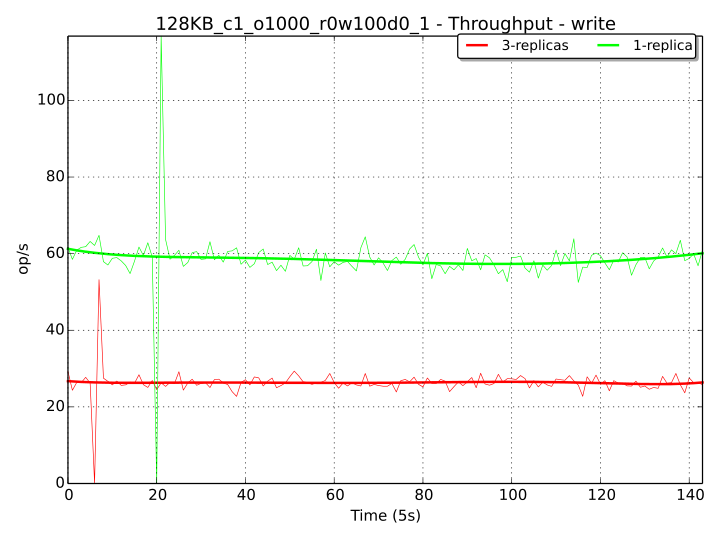 As an example to demonstrate the difference in performance caused by writing the replicas (in Ceph), we have setup a dedicated Ceph benchmark which is identical to the “1cont_128kb” 100% write workload with one single thread, except for the fact that writing operations are performed on a special pool with a replication size of 1 (so no copies of the object other than the original instance are made). 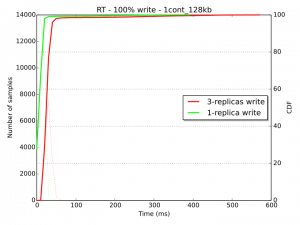 We can see from the results below that the theoretical difference that we would have expected (a 2x factor – when replicas are written to disks in parallel, starting from the 2nd copy) is precisely what we get. In the case of 100% Write operations, the bandwidth chart is reported below. 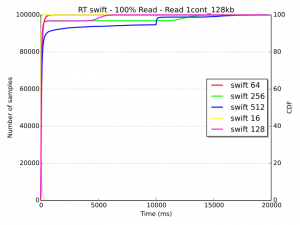 The performance of Swift reaches a maximum value of almost 40 MB/s when the objects size is bigger than 512 kB and 1024 kB respectively for 1 and 20 containers. On the contrary, Ceph performance continues to increase when the size of the object grows. Interestingly, for the same object size, Swift achieves better performance with a single container rather than with 20. The cluster network doesn’t seem to represent a bottleneck in case of write operations. The saturation of the system can be evaluated with the analysis of the response times. In the graph below, we can observe that for the “20cont_512kb” workload, when the number of concurrent threads is 512, the delay is ca. 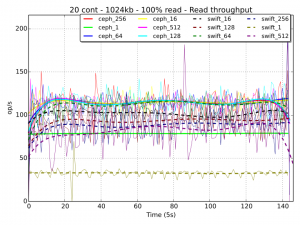 10 seconds at the 90th percentile for both Ceph and Swift. The value of delay increases to above 50 seconds for the workload with 10 MB sized objects, 20 containers and 512 concurrent workers (graph is omitted on purpose), resulting in a completely saturated system for both storage systems (with Ceph still behaving more responsively than Swift). For mixed read, write and delete traffic characterizations, every workstage has been repeated with a distribution of 80% read, 15% write and 5% delete operations. Each different type of operation was applied the whole set of available objects and pools/containers (so every object was available at any given time to be read, written or deleted). 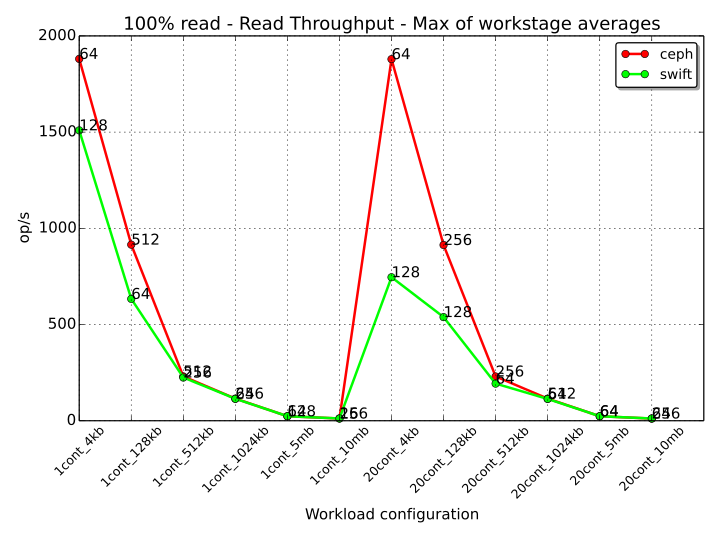 The graphs all share a similar “form” as the ratio between read/write/delete has been imposed with the workstages configuration (or better, with the configuration of works inside the workstages). 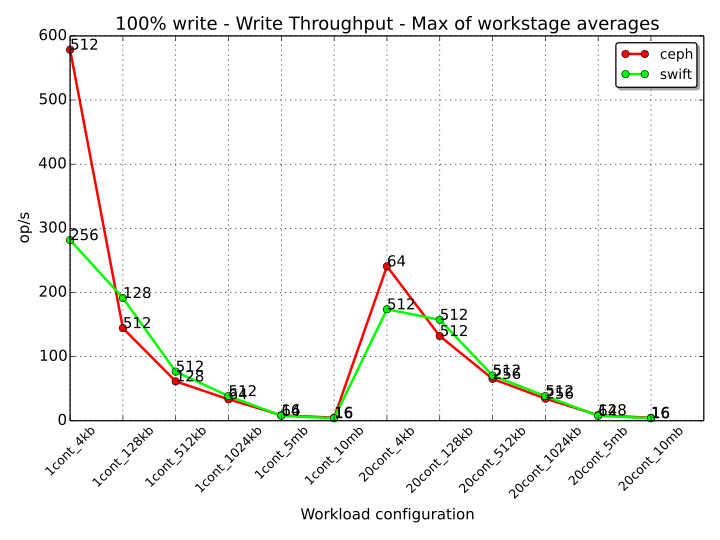 With respect to the pure write or read cases, there is an expected performance drop due to division of the workloads between different operations in the same timeslot. The proportions are obviously not maintained with respect to the 100% cases, meaning that the result that is obtained by e.g. 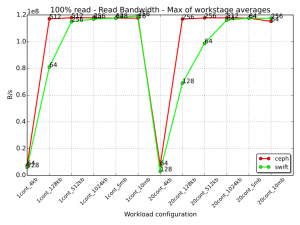 the read operation in this mixed configuration is not the 80% of the read throughput of the pure read case. The reason for this is to be found in the interference that the other two works are causing to the execution of a single work. For reading objects, the fact that the system is busy at serving also write and delete requests, causes an increased usage of resources than if only other read requests were served. 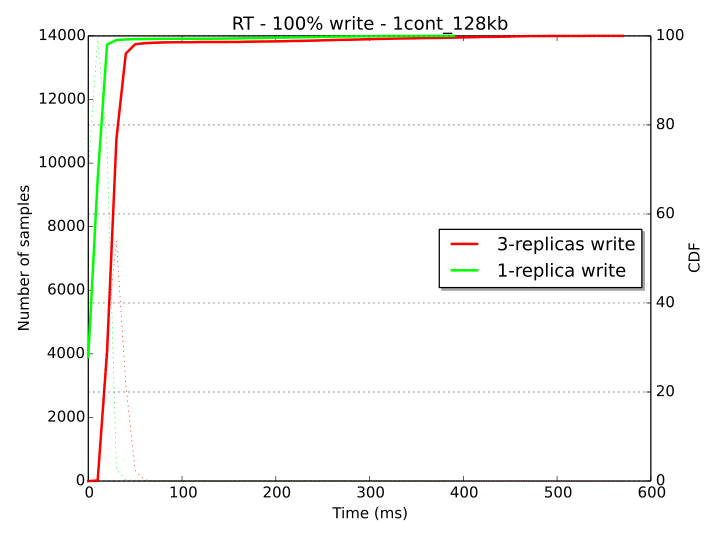 Consequently, the performance of read with respect to the 100% Read case, drops below 80%. For analogous reasons, write operations can be achieved more easily in a system that is busy only at its 20% in performing disk writes (for write works and for what may be needed by delete works). 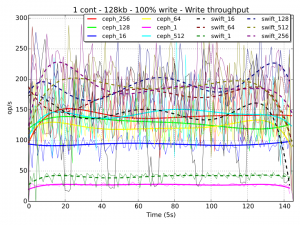 As observed in the previous cases, Ceph has a noticeable higher throughput than Swift when the size of the objects is small, so when the number of operations is higher for both systems. 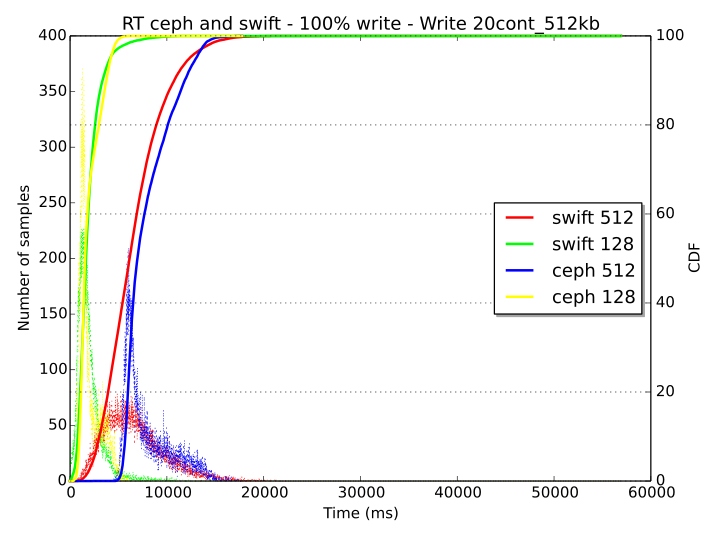 The gap between Ceph and Swift decreases up to be almost nonexistent when the objects have a size of 5 MB or 10 MB. 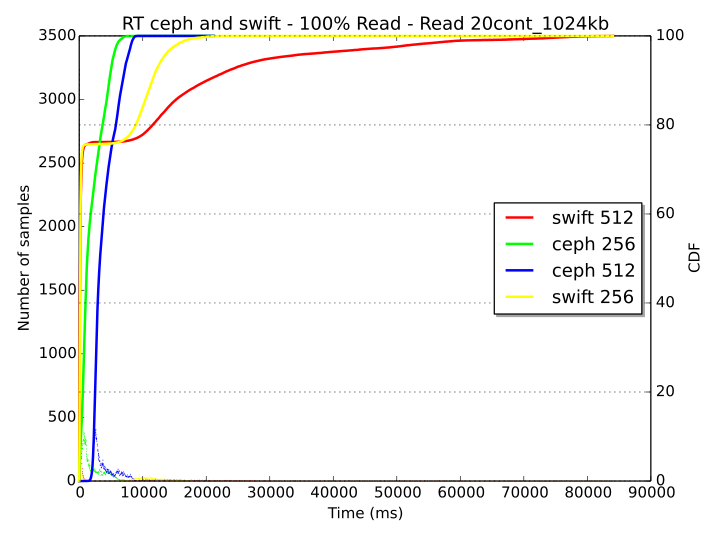 Consistently with the pure read/write cases, the performance of Ceph is more conservative than the one of Swift. With the latter, workers reach a point of starvation starting with a load of 256 threads at ca. the 75th percentile, while with Ceph, even if the system is completely saturated with 512 workers (with a stable response time of 20 seconds), all requests are served with fairness and reasonable delay up to 64 concurrent workers. If we consider the over-saturated case of 512 threads, we can argue that Swift behavior is actually better than Ceph’s. With Swift, clients requests up to the 60th percentile are served in a short time and the rest are certainly left to timeout. With Ceph on the contrary, all requests would be served with a delay of ca. 20 seconds, probably causing a timeout for all of them. 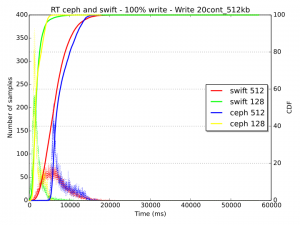 As also observed previously, it can be noted that Swift has a more greedy behavior than Ceph, showing a very good response time performance up to a certain percentile, but with an unfair treatment of a relevant portion of the remaining samples. The results for this study have been obtained with a small cluster consisting of only 3 servers, used in a configuration of 1 monitor/proxy and 2 storage nodes. Each storage server has been configured with two different and dedicated HDDs for data. Consequently, the results here presented, even if very relevant to this context and consistent for the experiment and use case that we wanted to analyze, should not be extended to larger storage deployments that can include hundreds to thousands of OSDs. 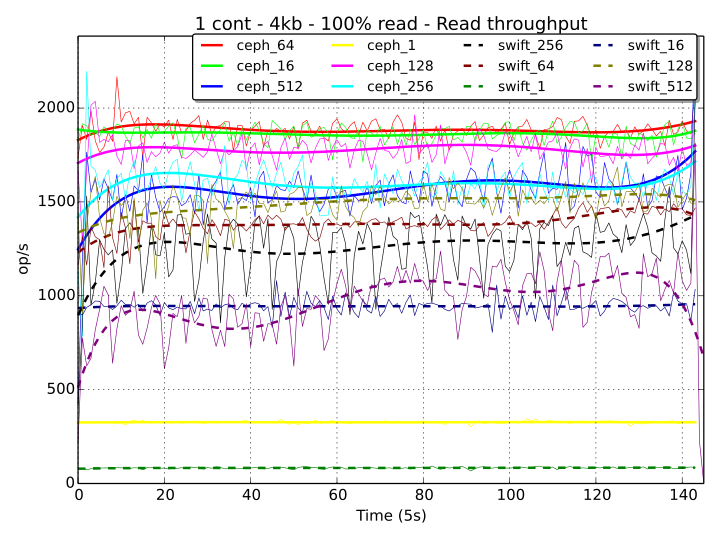 The results here analyzed demonstrate an overall better performance of Ceph over Swift, when both systems are used for object storage (with librados for Ceph and the HTTP-based ReSTful interface for Swift). For read operations, the most remarkable difference in throughput (number of operations per second) has been observed when accessing 20 different pools (or containers), each one containing 1000 objects of small size (4 kB). 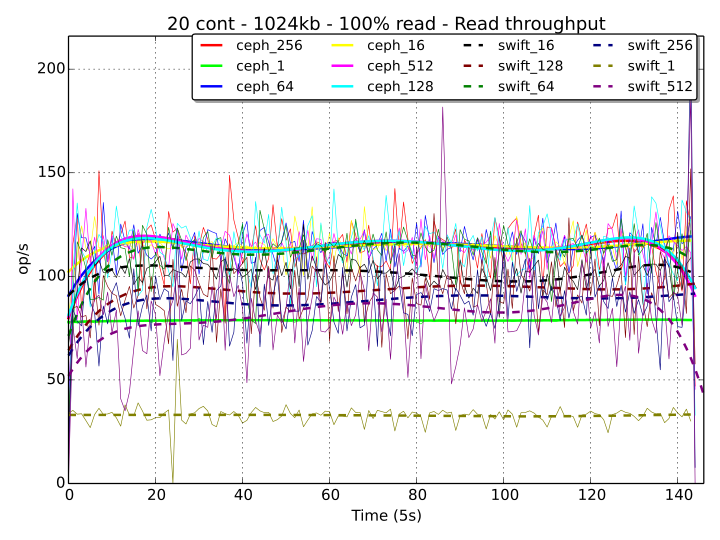 In this case, Ceph has reached a maximum average bandwidth of ca 7.5 MB/s, while Swift stopped at ca. 3 MB/s. 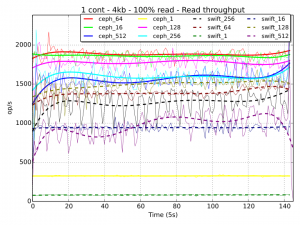 This result, given the small time required to perform a single read operation (due to the size of the objects), would suggest a faster lookup procedure for Ceph than Swift, due to smaller overhead when performing each operation. The difference in the read throughput decreases when the size of the object increases, to be basically zero up to a certain object size. This pattern has recurred also for write and mixed operations. For the collection of read statistics, we have to take into account that the networking infrastructure with 1 Gbps links has represented a bottleneck that has limited the read performance of Ceph, starting with an object size of 128 kB and of Swift, starting with an object size of 512 kB (when only one container was used) and 1024 kB (when 20 containers were used). 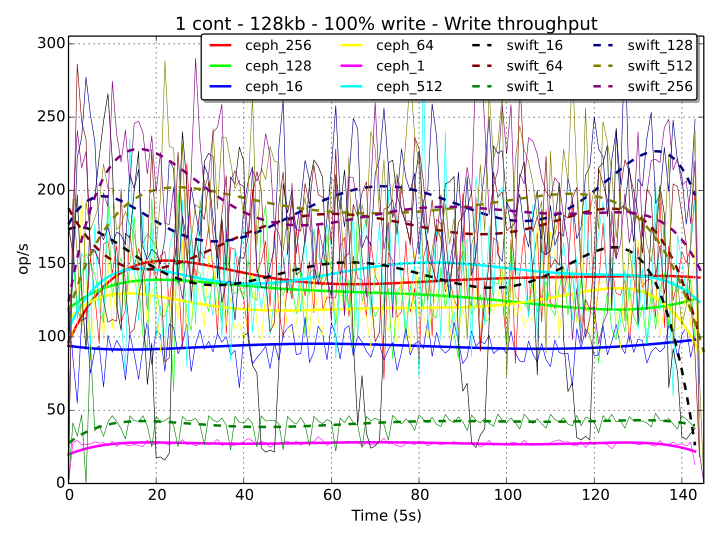 Concerning write operations, Ceph has shown a better performance than Swift with objects of 4 kB and has produced less throughput when the size of the objects was between 128 kB and 1024 kB. For this configuration, the management of object replicas was similar for both Ceph and Swift and the difference of using a replication factor of 1 instead of 3 has been shown for Ceph and has produced expected results. 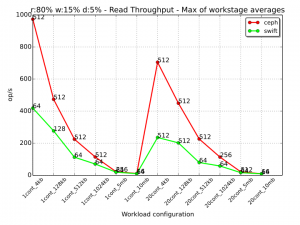 In the case of mixed read, write and delete operations, with the proportion of 80%, 15% and 5% respectively, we have observed higher throughput values with Ceph and, as in the previous cases, the difference was more pronounced when operating with smaller objects and almost zero with objects of 5 MB and 10 MB. The response time and saturation analysis of the systems has denoted a more greedy behavior for Swift and more tendency to fairness for Ceph. While up to a certain percentile, Swift has shown faster responses to client requests than Ceph, an eventually large number of samples were left to starvation, with unacceptably long response times that would have certainly led to timeouts. 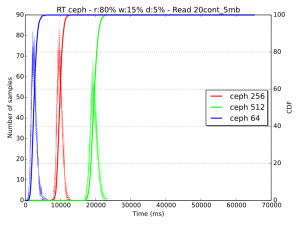 Ceph on the other hand has manifested higher response times at low percentiles, but a much steeper CDF curve, implying that the majority of samples could receive a response in approximately the same time and providing for a more predictable behavior. The ICCLab is proud to be part of the Cloud Foundry community. We are running regular User Group meet-ups for anyone with an interest in Platform as a Service in general, as well as Cloud Foundry and its ecosystem to come along learn, participate and hopefully have some fun too! 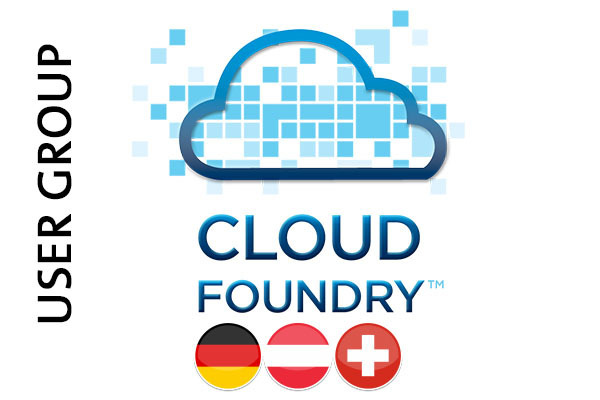 For more information about the Cloud Foundry DACH (Germany, Austria and Switzerland) User Group meet-ups, go to the official Meet-up page. Subscribe on it to get the news on upcoming meet-ups and to help build up the community! If you would like to help the DACH Cloud Foundry community with sponsoring meet-ups or present during one of the meet-ups, or just have a general question about Cloud Foundry, please contact christof.marti@zhaw.ch or ping @christofmarti. To get more information about our other cool events and news, follow us or ping us on @ICC_Lab. Ain’t no a fan of Steve Jobs. But in this he’s damn right. Here’s to the crazy ones. The misfits. The rebels. The troublemakers. The round pegs in the square holes. The ones who see things differently. They’re not fond of rules, and they have no respect for the status quo. You can quote them; disagree with them; glorify or vilify them. About the only thing you can’t do is ignore them. Because they change things. They push the human race forward. And while some may see them as the crazy ones, we see genius. Because the people who are crazy enough to think they can change the world are the ones who do. When setting up a cluster with ceph-deploy, just after the ceph-deploy osd activate phase and the distribution of keys, the OSDs should be both “up” and “in” the cluster. One thing that is not mentioned in the quick-install documentation with ceph-deploy or the OSDs monitoring or troubleshooting page (or at least I didn’t find it), is that, upon (re-)boot, mounting the storage volumes to the mount points that ceph-deploy prepares is up to the administrator (check this discussion on the Ceph mailing list). I wasn’t thinking about mounting the drives, as this process was hidden to me during the initial installation, but a simple mount command would have immediately unveiled the mistery :D.
For some other troubleshooting hints for Ceph, you may look at this page.